In this tutorial we’ll be setting up an upspinserver on an Ubuntu 18.04 x64 VM on DigitalOcean. Our upspinserver will be composed of a directory and store server, aka dir/store. In theory you could host them separately, but for simplicity we’ll keep them together on the same machine. As a side note, the upspin-ui command can automate an Upspin deployment to GCP, but we’ll be taking the manual route. Do remember it’s irrelevant which platform you choose. The official docs can be found here: Setting up upspinserver. We do not need to run upspin signup because we already created a user with upspin-ui in part 2. Instead we need to tell the Upspin world that we have chosen a location for our dir/store server, accessible at the same host name. So we modify our $HOME/upspin/config file by adding dirserver: and storeserver:, substitute with your own domain. Again, for the sake of this tutorial dir/store will live on the same machine and accessible with a single host name. We will not be using the -cluster flag, because dir/store live on the same machine. Domain List > Advanced DNS > add a TXT record as specified in the resulting text from the upspin setupdomain -domain=upspin.online command. # upspin.online descriptive text "upspin:a4386744462680e3c2243ce4cd409eb49402452f6a241..."
This step will be carried out on your cloud provider, e.g., AWS, GCP, Linode, etc. in my case it’s DigitalOcean. You’ll want your VM to have a static IP. 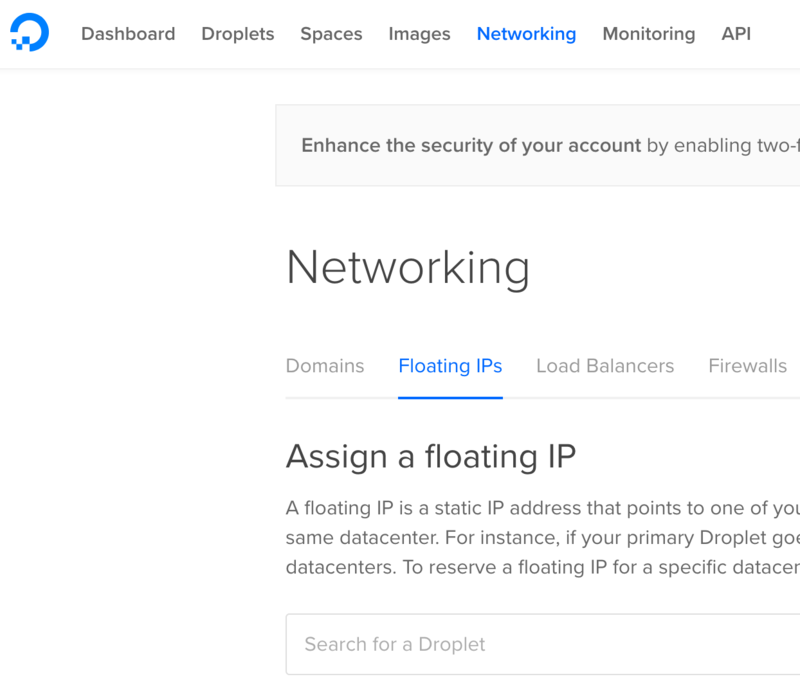 On DigitalOcean navigate to Networking > Floating IPs and assign your droplet a floating, i.e., static, IPv4 address. Now we tell our registrar that our subdomain, my.upspin.online, should point at the static IP of our VM. We’ll setup a non-root user, in my case it’ll be mfridman, substitute your own. Note that you need to run this setcap command whenever the upspinserver binary is updated. This is good, real good! Note that this command does A LOT. restarts it, puts the Writers file, and makes the root for the calling user. # Successfully put "[email protected]" to the key server. # Configured upspinserver at "my.upspin.online:443". # Created root "[email protected]". Side note, if you mess up navigate to advanced tips and tricks, I’ll have a section on fixing this up. On the remote server, you’ll notice a new folder /home/mfridman/upspin/server which contains a bunch of goodies.